On November 17, 2015, the United States Department of the Interior officially named this site to the National Register of Historic Places. 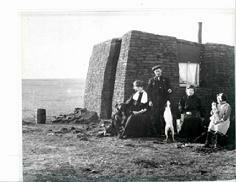 From the 1880s through the 1930s, 1200 Jewish farmers lived on over 250 homesteads in North Dakota - the fourth largest number of Jewish homesteaders in any state. Here, among the swaying Dakota prairie grasses and under the infinite sky, the largest Jewish agricultural settlement in North or South Dakota thrived. The Beth Itzchock (House of Isaac) Cemetery, the final resting place for at least 28 Jewish immigrants, is the only permanent physical reminder of this community. Over 400 Russian and Romanian Jewish homesteaders escaped persecution due to their faith (including the prohibition against Jews owning land for farming) and pogroms (organized mass killings of Jews endorsed by the Czarist regime) and settled on around 85 farms in McIntosh County beginning in 1905. After clearing rocks and boulders, growing wheat and flax, raising cattle and chickens, and selling cream from their sod houses, most were successful enough to own their land after the requisite five years under the Homestead Act or to purchase it sooner. Unlike most of their Jewish brethren who remained on or near the East Coast in big cities, these first-time farmers boarded trains to "The Great Northwest," staking their claims 20 years after McInstosh County was opened for homesteading. They settled in the stony, hilly area called "Judenberg"(Jewish hills) by their welcoming German-Russian neighbors. In addition to their inexperience, the Jewish farmers faced drought, prairie fires, early frosts, blizzards, the Spanish flue Pandemic, and the Great Depression. Nevertheless, with hard work, and God's blessings, this stony ground bore fruit. The Ashley Wishek Jewish community retained its religious identity far from any major Jewish population center, as evidenced by this traditional cemetery. They were a nationally registered Jewish congregation in 1907, before they owned a central building for worship or had a formally trained rabbi. The traveled on horseback to each other's sod houses and barns for a "minyan" (the 10-man quorum for certain prayers), and celebrated Jewish weddings outside on the prairie under the "chuppah" (wedding canopy) with sponge cake, homemade wine, and dancing to washtub drums and spirited violins. The homesteader family names of the proud American interred here include Auerbach, Becker, Bender, Berman, Bloom, Dorfman, Ewart, Filler, Friedman, Goldstone, Grossman, Jampolsky, Ourach, Parkansky, Raich, Reuben, Schlasinger, Silverlieb, Smilowitz, and Weil. May God bestow favor upon you and grant you peace. 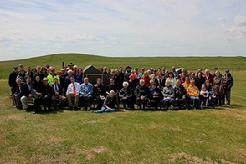 North Dakota Jewish Homesteaders Day Whereas, it is important to recognize the contributions that this important group made to North Dakota's rich history; as hardworking farmers, business owners, and proud active citizens of the State of North Dakota. 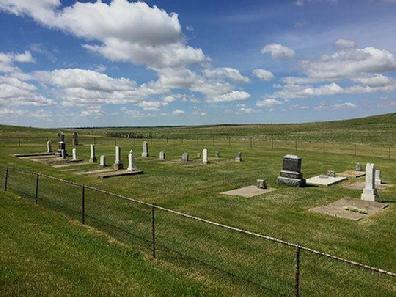 Ashley Jewish Homesteaders Cemetery - National Register of Historic Places Keva Bender, one of the Russian Jewish Homesteaders buried there, defiantly said in 1905, �We can prove to the world that the Jew can be a farmer.� He did as did the Jews of Ashley.